(without stand or speakers) 42.3" x 25.2" x 3.4"
Barco's LDX-46 display with LED backlights has been designed for use in a wide variety of professional applications. The LDX-46 produces crisp, bright and color-accurate images on a 46” screen size. Featuring LED backlit LCD technology, the LDX-46 boasts a high brightness and wide color gamut and provides an exceptionally thin and space-saving design. 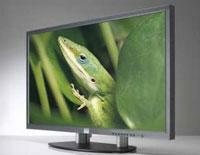 Available in native full high definition (1920 x 1080 pixels), the LDX-46 is a high-quality display for long-term usage. Barco's LDX-46 combines the typical benefits of liquid crystal technology (such as low maintenance costs) with energy-efficient LED backlights, reducing image burn-in and colorations, which makes it perfectly suited for long-term usage.